As dream debuts go, it probably doesn’t get any better than scoring after 18 seconds. 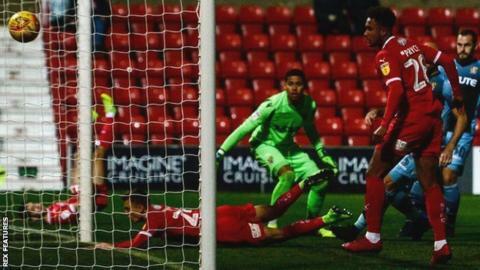 That’s what 18-year-old Swindon striker Sol Pryce managed to do against Stevenage on Tuesday, before scoring what proved to be the winner in the last minute of the first half. BBC Sport takes a look at a few other players who enjoyed brilliant professional debuts, as well as a few that didn’t quite go to plan. When it comes to goalscoring debuts, Jimmy Greaves was a repeat offender. Not content with achieving the feat for Chelsea aged 17 in 1957, he went on to repeat the trick for his national side two years later and then did it again at AC Milan, Tottenham and West Ham. Another player whose career Pryce would love to emulate. Alan Shearer hit a debut hat-trick for Southampton against Arsenal aged 17 years and 240 days in April 1988 to break the record for the youngest player to score a hat-trick in the Football League. The previous owner of the record? Greaves. Like Greaves, Shearer went on to score on his debut for England and again with Blackburn, both in 1992. His first game for Newcastle in 1996 was where the run stopped, as Everton consigned the Magpies to a 2-0 defeat. Still, it didn’t do him too much harm. He went on to plunder a club-record 206 goals for his hometown team. Back in August 1997, Wolves were on the lookout for a goalscorer to help support ex-England international Steve Bull. Boss Mark McGhee decided to throw young Irishman Robbie Keane in away at Norwich City on the opening day of the season and the 17-year-old did not let him down, scoring twice in a 2-0 win. Keane moved on to then-Premier League club Coventry in August 1999 and scored a double on his first appearance to help the Sky Blues to a 2-1 win over Derby County. In total, Keane scored 325 goals in 737 appearances before deciding to hang up his boots on Wednesday. It might have taken him more than 18 seconds but James Vaughan’s goalscoring debut for Everton in 2005 was still pretty impressive. Then aged 16 years and 271 days (to be precise) he came on as a 74th-minute substitute against Crystal Palace and 13 minutes later became the youngest goalscorer in Premier League history. Thirteen years on, the record still stands. With Anthony Martial and Wayne Rooney both out injured, Manchester United boss Louis van Gaal turned to a then 18-year-old Marcus Rashford for a Europa League tie against Danish side FC Midtjylland in February 2016. Rashford, who had been scheduled to be on the bench before Martial was injured in the warm-up, was not even listed on the back of the matchday programme but that did not stop him from scoring twice to help the Red Devils to a 5-1 win. Proving his European exploits were no fluke, he scored twice against Arsenal in the Premier League three days later and subsequently scored on his first appearance in the League Cup, Champions League and FA Cup – as well as scoring on his England debut and England Under-21 bow. Summoned from the bench in extra-time of a League Cup tie between Arsenal and Birmingham City in October 1997, Jason Crowe was clearly keen to make an impact for the Gunners. Just 33 seconds later he’d certainly managed to do that – sadly it was because he’d been sent off for a high tackle. Unsurprisingly, it remains the fastest red card received by a Gunners debutant. It might not have been as bad as Crowe’s debut but Lee Hendrie’s Aston Villa debut in December 1995 will not be a game he looks back on fondly. On as a first-half substitute, the midfielder was booked for kicking the ball away before being sent off in injury time as Villa slipped to a 1-0 defeat at Loftus Road. Even QPR boss Ray Wilkins came to the teenager’s defence, saying: “I’ve an immense amount of sympathy for him. OK, so it wasn’t his professional debut, but Jonathan Woodgate’s first game for Real Madrid deserves a mention just for being almost comedic in its disastrousness. Woodgate joined the Spanish giants for £13.4m from Newcastle in August 2004 but a thigh injury stopped him from featuring until September 2005 when he came on as a first-half substitute for Ivan Helguera against Athletic Bilbao. Before the half was out, the England international had headed into his own net and by the 65th minute his day was done after he was sent off for a second bookable offence. Woodgate reflected afterwards that “it was not the best start in the world”, which seems a fair comment.